Ever since I got a suggestion to pair the blueberry marshmallows with lemon white chocolate, I knew I had to make it. Rocky road-style seemed cool — cutting the marshmallows up into cubes so that they turn into lavender pockets within the white chocolate coating.I had every intention of tempering the chocolate. But 1) I did not have enough chocolate to let 25% of it go to “seeding” the chocolate during tempering and 2) I did not have enough chocolate to fill the bowl to reach up to the immersion line of my thermometer. But, it’s not like I was going to sell them…. I just wanted a taste…. So, with a lazy determination to approximate tempering without any concern for accuracy, I simply melted the chocolate over a double boiler, added a large pinch of Meyer lemon zest, waited for it to cool down and thicken a little, heated it a little more, and mixed in cut up marshmallows and spooned them out into rocky road-like clusters. After chilling them in the refrigerator, I looked for the unsightly signs of untempered chocolate, but they looked appealing. The finish is a little bit matted, but there are no streaks of cocoa butter on the surface. If anything, the coating is a bit uneven in places, but it’s rocky road…. It’s supposed to be rough. The white chocolate, and occasion tinge of lemon, mostly overpowers the blueberry, but for me, it’s worth the look of it and the texture that alternates soft marshmallow and comparatively crisp chocolate several times in one bite before it all melts slowly away. In the entertainment industry, I would sometimes get random free film/TV paraphernalia. An Amityville Horror crew jacket. A “Watching Ellie” Season 2 1/2 baseball cap. A satin robe with camouflage print dotted by faces of Animal, the Muppet. In the food industry, the free stuff is a little different. Now I start the search for a toasted flax seed recipe…. Today we had our finals. We had a 25 question Math final that we had 90 minutes to do. Multiple choice. It was a mellow redux of things we’ve been doing every day in class, and I mastered it. We had practice tests and homework all along, so by this point, I could spend a whole day converting one amount into every unit known to man, one by one. Next was Science. 40 questions in 60 minutes. Also multiple choice. After being given such a wide molecular picture of the universe occupied by fats, flours, leaveners, sugars, ovens, and eggs over the course of the past 10 days, I knew that Science was trouble. We had no practice tests to work the material into our minds, and only our re-readings of notes and books to memorize everything. I took as many facts and principles to heart as I could and planned to become better acquainted with the rest as I got more experienced. So, when asked questions such as “what is the enzyme present in pineapples,” my most honest response would have been “I promise I’ll know it when the time comes when it matters.” Or, “I’m going down in flames.” Instead, I chose “c.” Because it was there. Anyway, the first couple weeks turned out to have a fair bit of work involved– reading and math problems every night, about 10 quizzes/exams cumulatively, one 4-page paper, one Excel cost sheet, and a 1-page paper. We begin our 3-day ServSafe certification class tomorrow, to learn how to handle food safely. Then Monday is our orientation to the kitchen, and Tuesday, we bake! 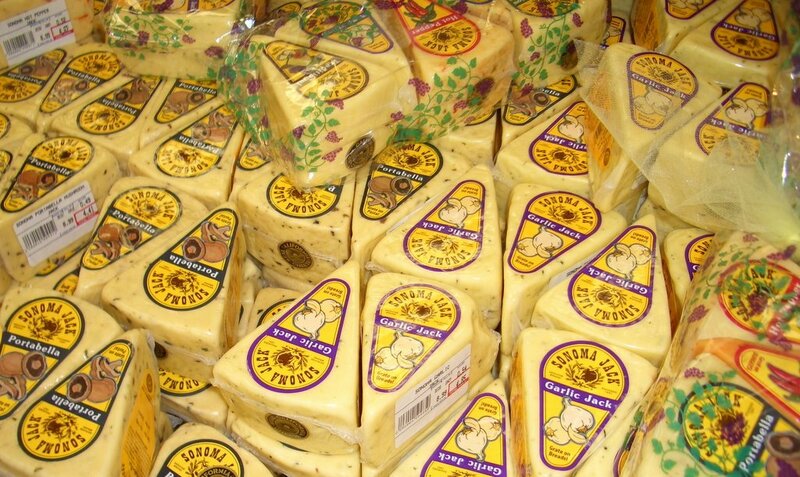 I wish that I could go to Della Fattoria every Sunday morning. 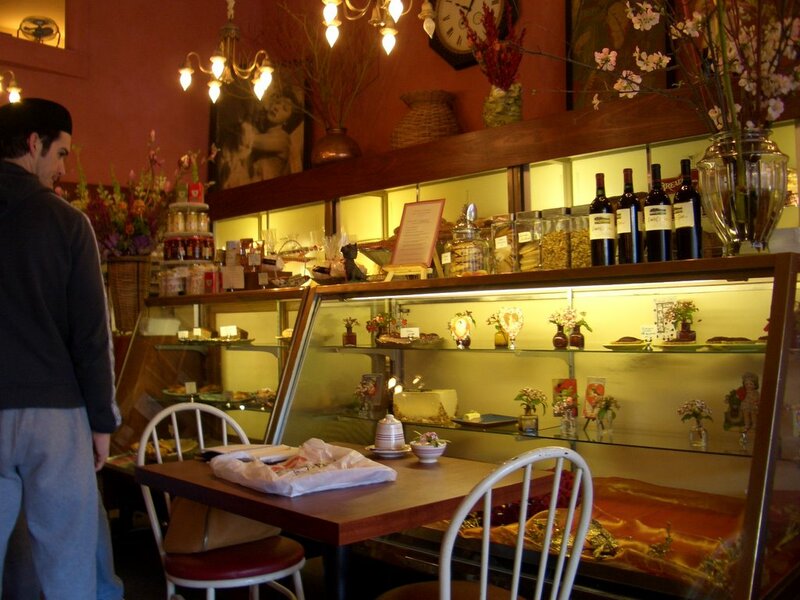 The streets of Petaluma, in the southern part of Sonoma county, may be a bit overbleached by the sun, but inside Della Fattoria is the coziest cafe you could want. Colorful, but mellow. You can come with friends to linger and sip from large bowls of coffee or hot chocolate, or come alone, as I did, to enjoy the communal table and read the newspapers that are strewn about or read a Wine Spectator to understand wines just a little bit better, as I did. 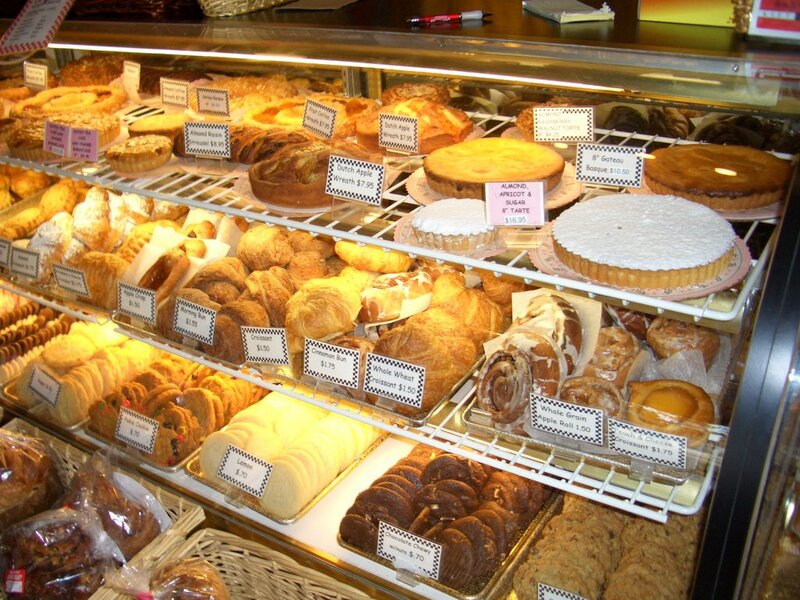 There are cases of pastries… and shelves of bread… and jars of cookies and candies for sale, though it is a rather small space. 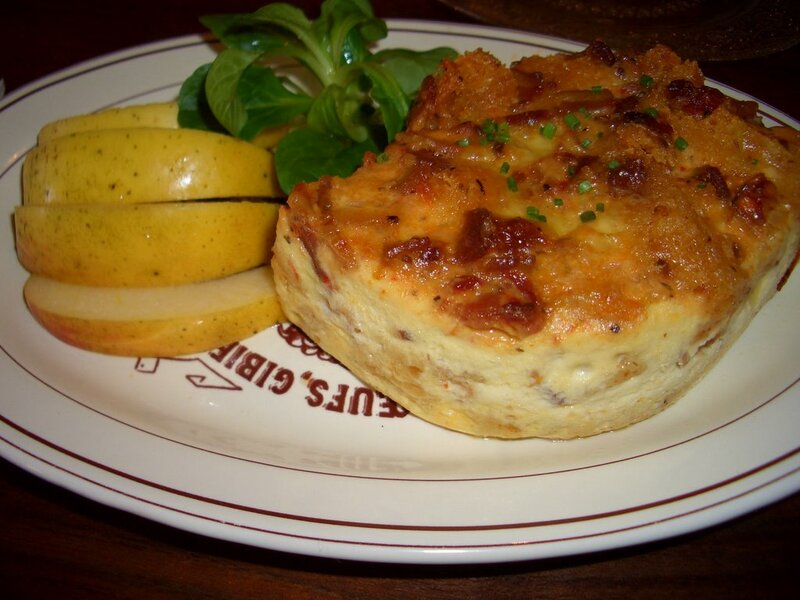 I chose the Breakfast Bread Pudding made with their polenta bread and bacon and sundried tomatoes and cheeses. The rich aroma matched its creamy consistency, and thank goodness for the apple to provide some tart contrast. 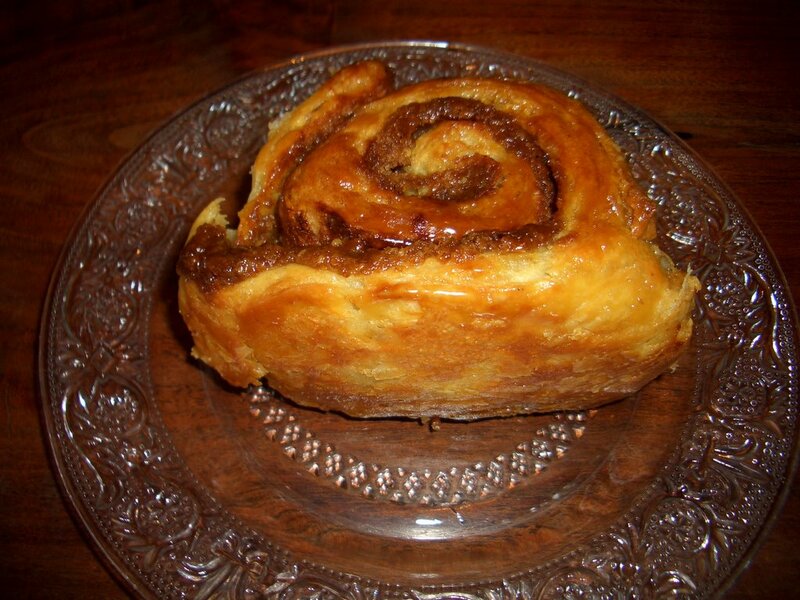 The cinnamon bun, on the other hand, was a sweeter contrast. Much more like rolled up croissant dough saturated in butter so that the swirls were slightly crisp on the outside and almost juicy with butter on the inside, it was also a rich pleasure. Many of the pastries and breakfast items are much less indulgent, so don’t be put off by the festival of butter above. I was tempted to buy a poached pear tart to take home with me, but I bought a loaf of their Meyer Lemon Rosemary Campagne bread instead. I was a bit disappointed with it. When I tried it at home, the interior and crust were too gummy for me too enjoy, and the interior was a bit dry. It is, perhaps, a sign of control on the part of the bakers that they only TOP the bread with the lemon and rosemary (and olive oil and coarse salt), but some flavoring in the rest of the bread might have masked the consistency problem. This may be how it normally is, how it is on off day, or if they gave it to me while it was still warm and put it in the bag, it could have been softened by steam on the way home; this happened when we made breads at CIA, and I took a loaf home that hadn’t cooled completely. I didn’t notice it being warm at the time, but who knows. Their breads are baked in brick ovens heated with wood fires, so I would be willing to give their breads another try… after a sampling of the poached pear tart. 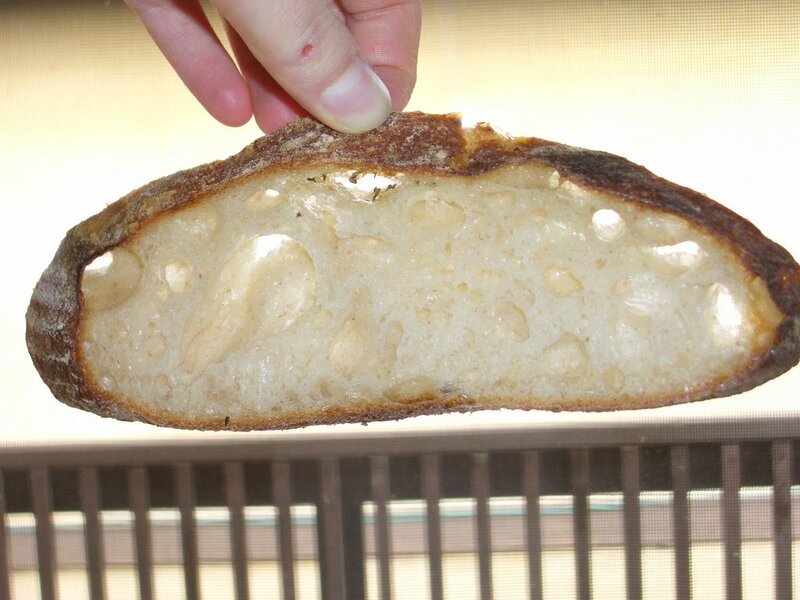 Oh, and breads such as these should have almost translucent spots that show that the starch gelatinized properly. I tested it. This one passed. 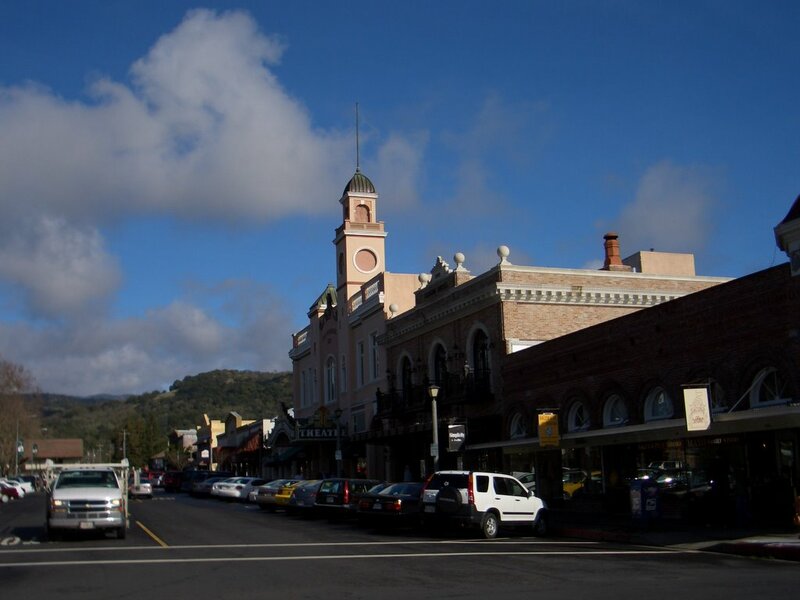 Like Napa, Sonoma is a town, a valley, and a county. 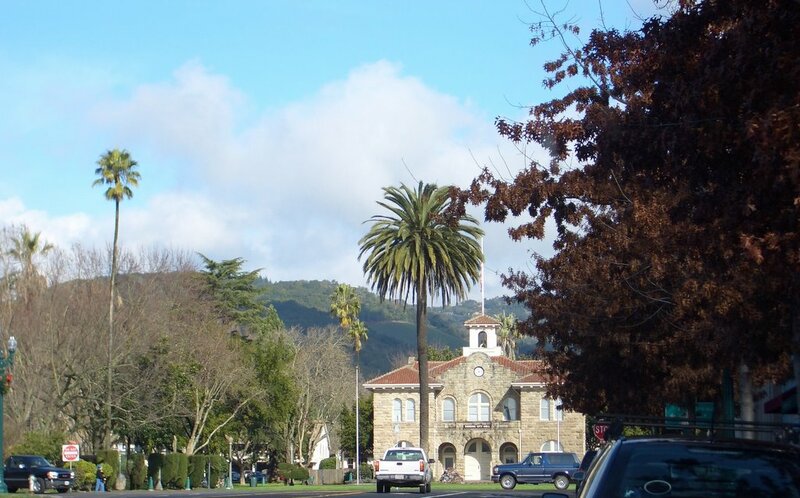 When I woke up this morning in Napa, it was a little foggy, but I thought it might make for atmospheric drive so I aimed for the town of Sonoma. 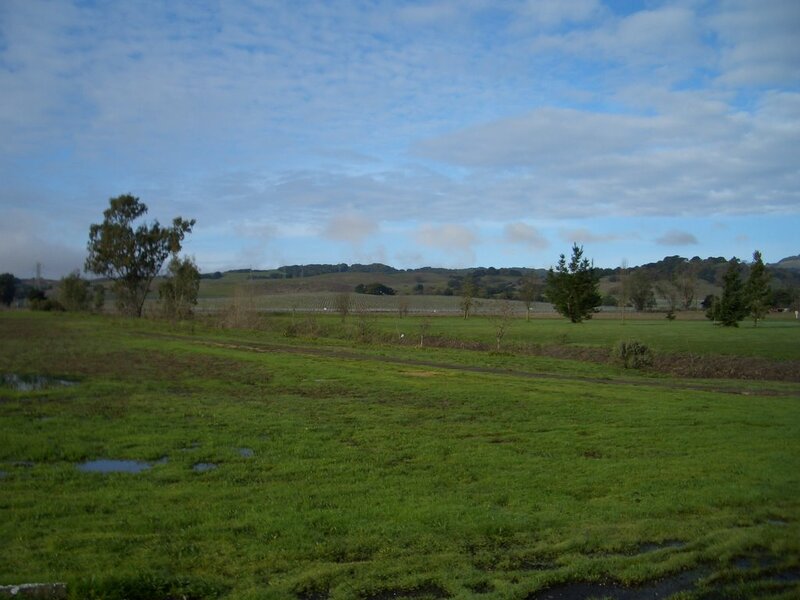 As if I’d wandered into Oz, Sonoma was surprisingly clear and sunny, with a mostly blue skies and rolling green hills. This is just outside the town of Sonoma. I know what the word means, but I don’t know what the sign means. The downtown is centered around a square, which has a park and City Hall in the center. I was just on a morning mission to scope out the town, so I just walked around the lovely square, which is lined with shops on the outside. 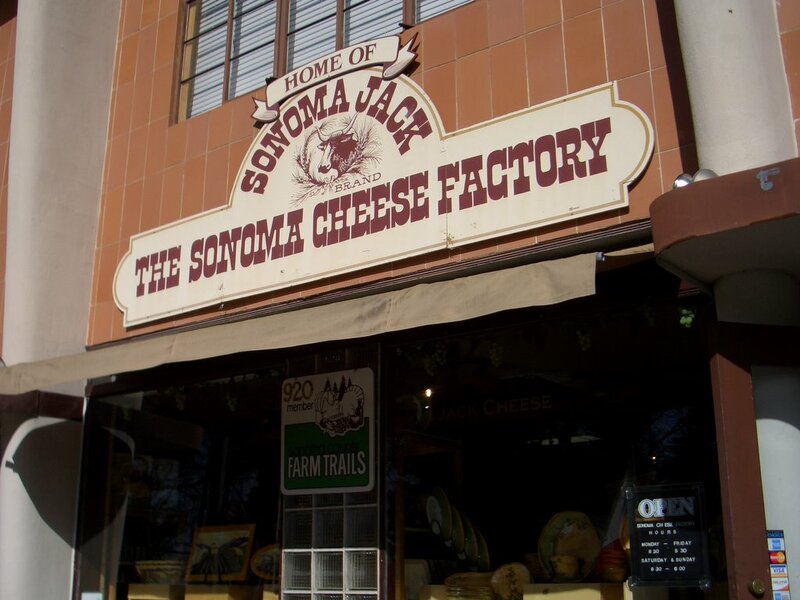 Sonoma Cheese Factory is a landmark on the square. 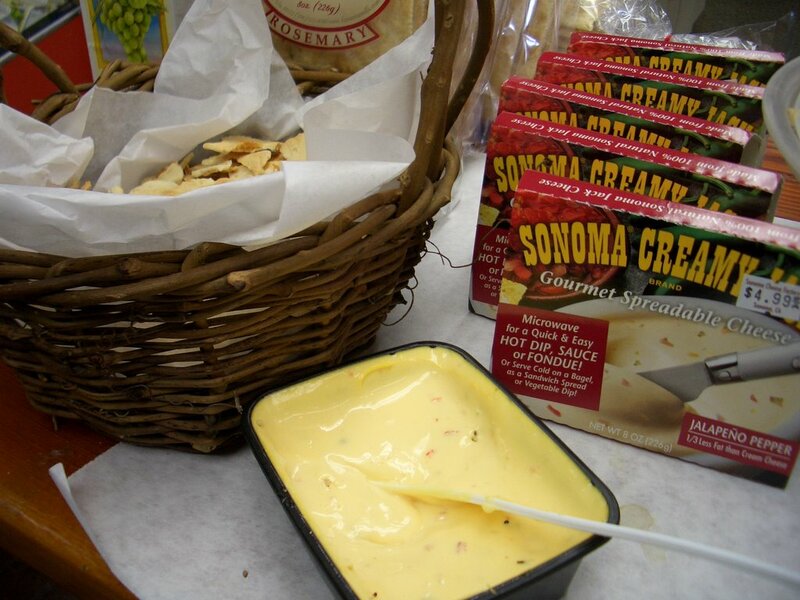 They’ve been making cheese since 1931, and are known for their Sonoma Jack. Lots of jack. Lots of free samples. After I tried them all, I settled on the hot pepper one. 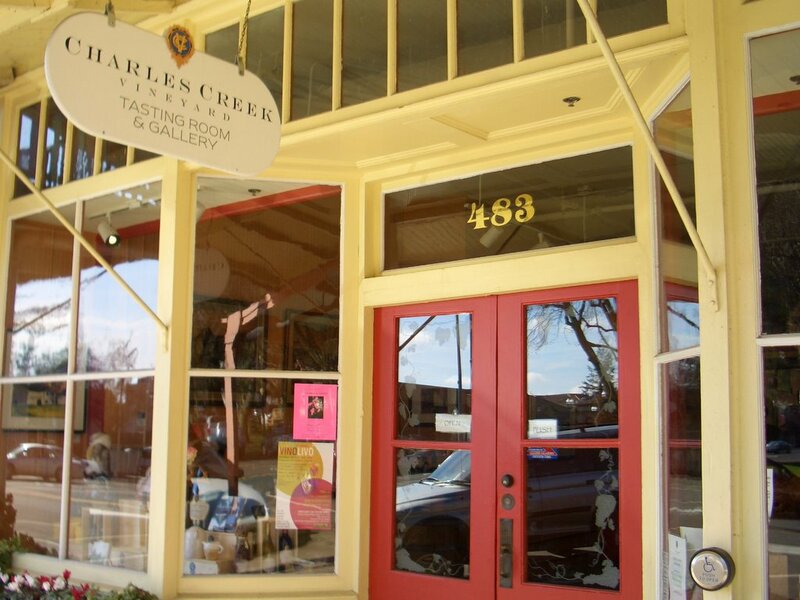 Although it’s great fun to drive around wine country and visit what you find in the greens hills and valleys, a benefit of stopping in towns is that there are often stores operated by wineries that have tastings. Drunk driving is a big problem here, so such stores let you drink and rest and explore until you can drive again. In contrast, killing time in a rural winery’s parking lot is little fun. I was excited by the popular Basque Cafe. 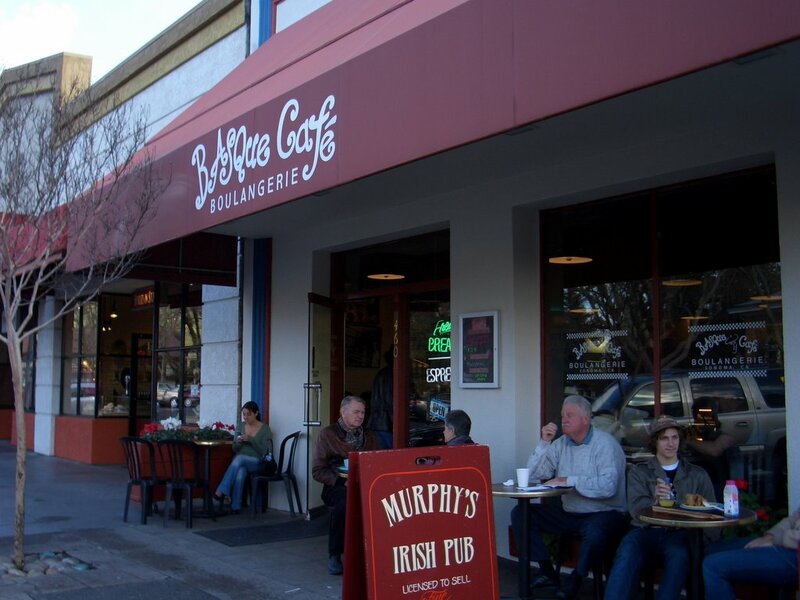 The square is quite large, and it was a good stroll to see the variety of establishments. 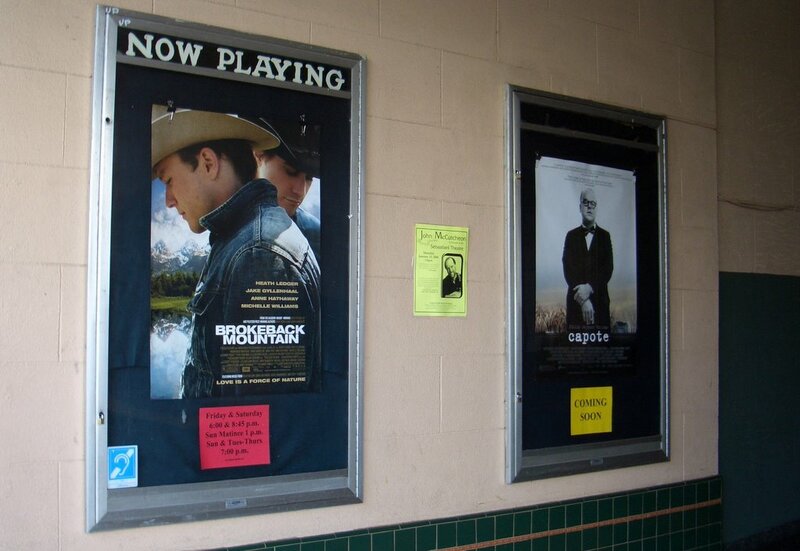 I was impressed to see an art house movie theater. 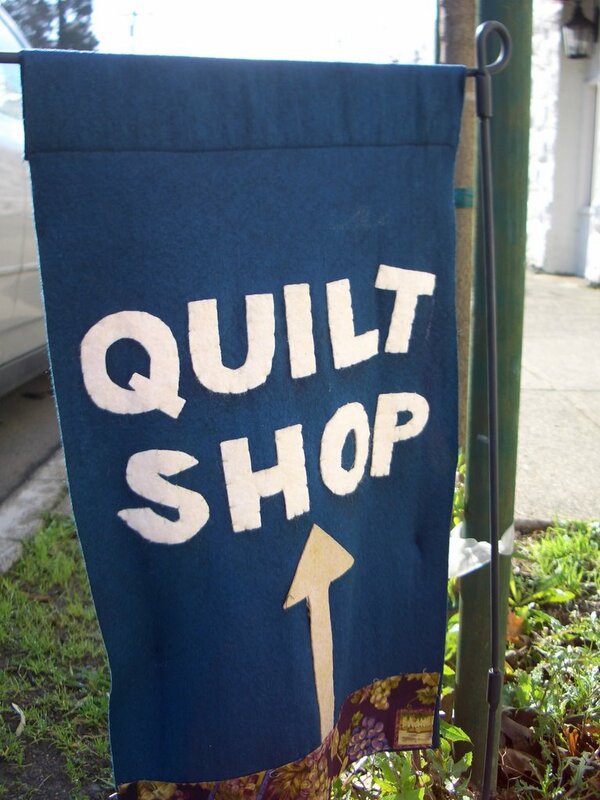 I was also impressed by the prospect of a quilt shop… or maybe the idea of it–I didn’t seek it out. And how to get them hooked young…. 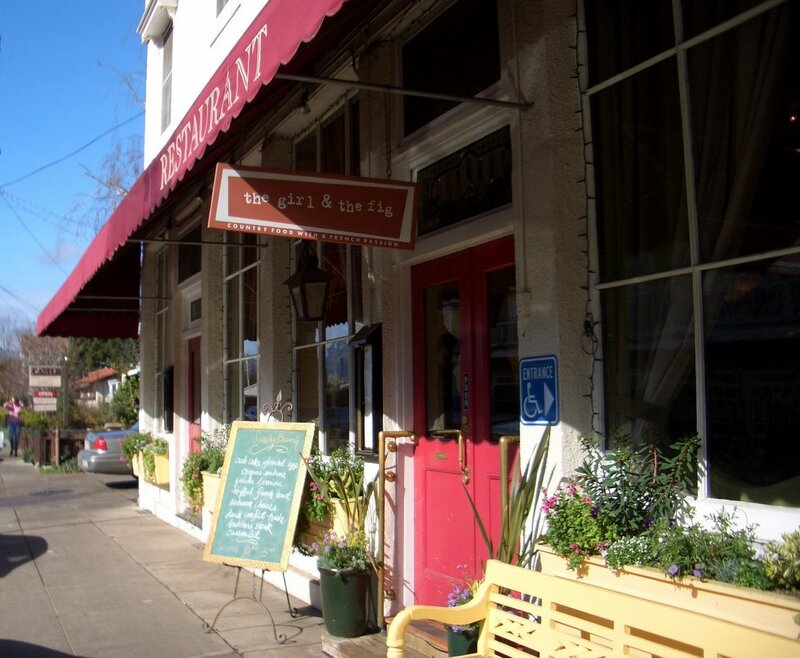 The girl & the fig is probably the best known restaurant in town, and you’ll see their products, such as spreads and sauces, everywhere in the valleys and beyond. 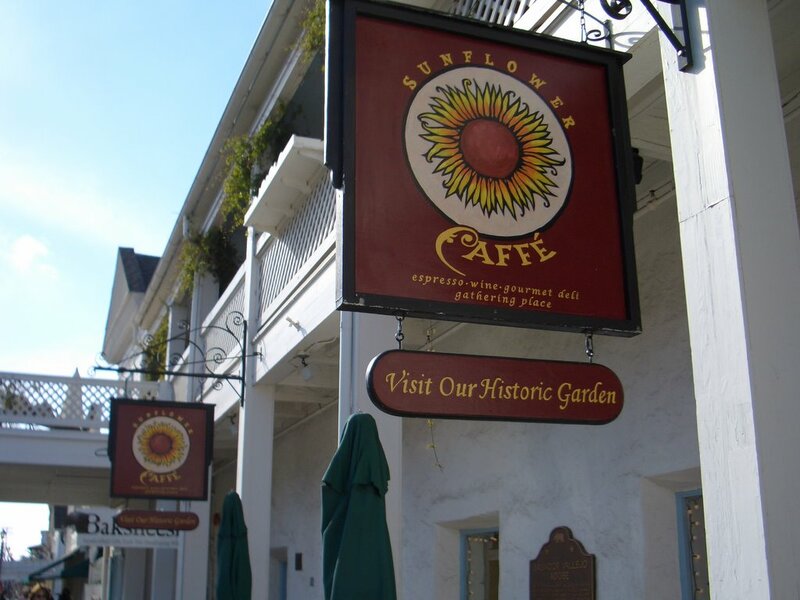 With so much competition, having an historic garden can’t hurt. There were also quite a few arcades around the square lined with little shops. Yes, this one has a store called Scandinavian Trends with a gnome in front of it. 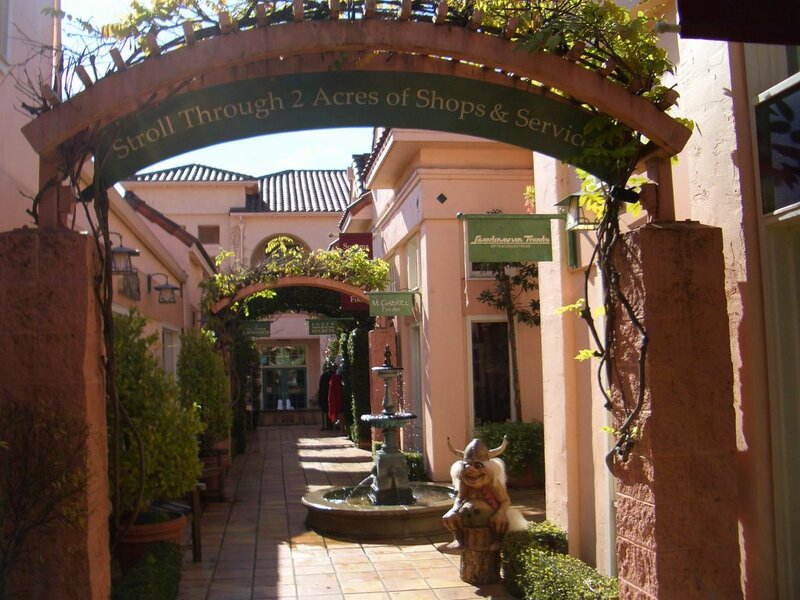 Sonoma reminded me a lot of Healdsburg, which is a town in northern Sonoma County that is also centered around a square. The weird thing is that, despite the variety of stores and architecture, these towns also remind me of New England, with their modern quaintness and traditional quirkiness and assortment of jams for sale. The main difference is that New England rarely ever gets this dry and sunny. 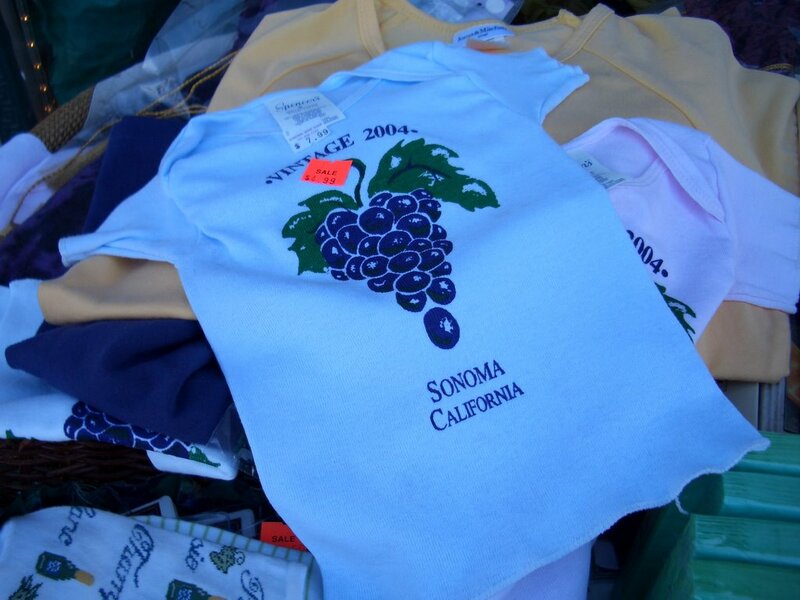 You are currently browsing the Sweet Napa weblog archives for January, 2006.